Phenylpropionate, compared with the classical decanoate, has a shorter half-life, and therefore allows faster delivery of the active substance to the blood. Scientifically not confirmed, but the athletes themselves say that Nandrorapid has a lower propensity for water retention, and therefore it is better combined with androgenic drugs. Nandrolone is a substance formed in the body in response to heavy and prolonged physical exertion. However, the amount of the natural hormone is small, at a few nanograms per milliliter of urine. What swing phenylpropionate, it is in demand due to several indisputable advantages. First, the steroid allows you to quickly restore the body’s own testosterone production. Secondly, the drug has a lower likelihood of adverse reactions. And, thirdly, even with the manifestation of side effects, they quickly disappear after the abolition of the steroid. The ether chain of phenylpropionate is about 2 times shorter than that of the “deck”. At the doping control, the steroid detects for about 16-18 months, so its use by professional athletes is possible only with the inclusion of masking agents. Increased protein production. In the course of Nandrorapid, marked muscular hypertrophy is observed. The steroid allows the athlete to gain up to 10 kilograms of mass. In this case, one cannot speak of a significant phenomenon of recoil. Strengthen ligaments and joints, improve their mobility. 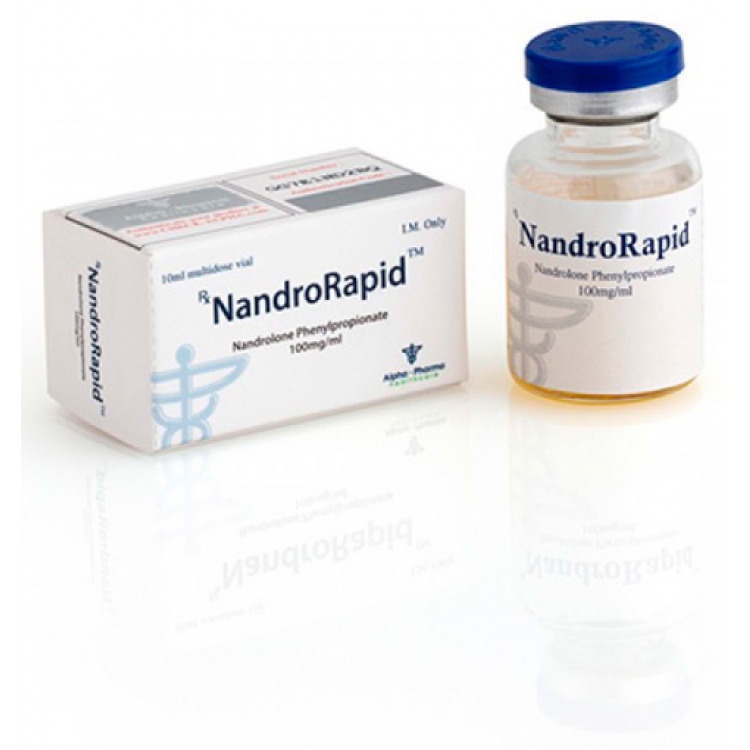 Nandrorapid stimulates the formation of collagen and synovial fluid. Stimulation of the use of fat cells as an energy source. The increase in red blood cell mass, and as a result, endurance athlete. The course Nandrorapid is not recommended for minors, and for athletes who have any contraindications to taking AAS. Given the not long side chain of ether, the optimal frequency of steroid injections is 2 times a week. The dosage is determined on the basis of previous experience with the use of anabolic and androgenic drugs, the physiological characteristics of the athlete, the use of additional pharmacology on the course. When taking nandrolone solo, the rate of substance is about 150-250 milligrams per injection. Exceeding the weekly volume of 600 milligrams can only professional athletes, and only after consulting a doctor. As for taking Nandrorapid in combination with other steroids, Turinabol, Testosterone, Masteron and Methandrostenolone are the best choices. In combination courses, it is advisable not to exceed a total weekly dosage of AAS of 500 milligrams. An acceptable combination is nandrolone with Turinabol and Winstrol. The positive side of the steroid is its slight aromatization. Side effects from Nandrorapid are more associated with an increase in prolactin levels. Boundary doses of a steroid can cause an increase in blood pressure, water accumulation in the body, gynecomastia, and a decrease in libido. To prevent negative reactions, it is advisable to use cabergoline or bromocriptine. In general, Nandrorapid is not recommended for non-professionals. Nevertheless, it significantly suppresses the production of its own testosterone, and its recovery without the use of special pharmacology is a rather long process.